Wyoming's pristine and scenic rivers attract avid whitewater paddlers and vacationers looking for a thrill as well as those who prefer to float leisurely. No matter what your preference, you'll find a guide and a stretch of river suited for you in Wyoming. With world-class waters from the Snake River in the west, the North Platte River spanning the central and eastern portion of the state, the Bighorn river in the north, the Green River in the south, Wyoming is home to endless opportunities to float, raft, kayak and canoe these winding waters. Browse a full list of guides below. Embarking on a scenic river trip means one thing: relaxation. The slow meander of the water and the lazy dip of a paddle are your ticket to rest and leisure. Along with an experienced guide and a serene state of mind, this is your chance to marvel at nature and take it nice and easy on the water. 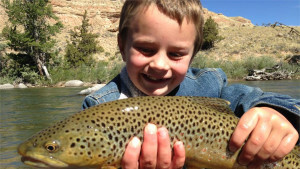 You can also schedule a float trip and cast a reel with an expierienced fishing guide. Wyoming is also home to canyons and stretches of river with whitewater offering enough bounce and splash for even the most thrill-seeking rafters. And if you’ve never rafted before? Not to worry. Experienced guides who are passionate about whitewater will teach you everything you’ll need to know. Whitewater Rafting, Wind River Canyon. Don't be afraid to get wet. Hit some rapids during a whitewater adventure. Leisurly float trip down the Snake River.